We rang in 2014 at home, safe and sound, just the four of us. We did have a guest during the afternoon, our next-door neighbors' grandson, visiting from Michigan for the holidays. He and the LB played and ate some chips before he was collected for dinner. Then we ate homemade pizza and had a "sleepyheads" countdown to seven o'clock, the Girl Bear's bedtime. We toasted with chilled Orangina and made noise with various musical instruments (I used the Chinese "clackers" seen above). I got this idea from the wonderful Thelma Domenici, local etiquette maven, who suggested it earlier this week in the newspaper. The small Bears went to bed and the big one and I spent the evening watching Good Will Hunting, one of my favorite movies ever. We were in bed by 10:30 ourselves. In the morning, as soon as we'd finished breakfast, we got to work putting away Christmas. We were ready. We don't decorate a lot, but we usually have the tree up for a full month and it feels like plenty. It's nice to have the living room back in normal condition. The three Bears went out to take down the outdoor lights and dispose of the Christmas wreath, which we'd displayed on our courtyard gate. I put away boxes, changed my garden flag in the courtyard to a generic winter one, and put away the Christmas runner and red-berries arrangement I'd been using in the dining room. I put on this colorful patchwork tablecloth I inherited from my husband's family. I really love this cloth. It doesn't fit either of our tables, which are both oblong or oval. But the vintage fabrics are cheerful and they make me happy. I went into the kitchen, where the rainbow maker was throwing hundreds of tiny shards of light throughout the room. We keep it in the breakfast nook window, which faces east; especially in winter, sunny mornings feature indoor rainbows. Luckily, we have lots of sunny mornings, even in wintertime. The Christmas cactus seems to be heading into another bloom cycle! It's still on our kitchen table, where it looks bright and colorful in the sunshine. I didn't know I'd get a whole new set of buds after the first flowers withered. I'm really excited for more flowers. And the paperwhite narcissus is now blooming too. I'd never grown one before and didn't know the flowers would be so tiny. But I love the delicateness of them, and the scent is heavenly. I'm definitely going to grow them again next year and I think I'll try to plant the bulb outdoors when this one is finished blooming. I made myself a cup of tea and got to work on tonight's dinner, slow-cooker minestrone. It feels like high time for a light, healthy meal. Lots of veggies, tomatoes and beans, a little pasta, some parmesan cheese at the table if desired. I spent a quiet half-hour chopping, sauteing and measuring dried herbs. I adore my slow-cooker and I keep it busy. I took my tea into the living room, where I sat down with my current book, and enjoyed the brightness and warmth of the sun streaming through the south-facing window. The living room is my favorite room in winter and I try to use it a lot, for both reading and handwork. I don't have a crochet project at the moment, unless you count the teeny dollhouse items - which make my head hurt a little. I've ordered some yarn, though, and will be starting a crocheted gift soon. This chair by the sunny window will be my winter crochet headquarters. I need to dust, and put away a few more odds and ends. I love this house. It's warm and comfortable and it's full of things we love. Some we've made, others we've bought or inherited, others we were given as gifts. When we moved here, we had an infant and a toddler, and not enough furniture to fill the living areas (we'd never had two of them before). But we've made it ours, each putting our stamp somewhere, and it's a happy house. We've finished the too-busy season and we're heading into the sometimes-too-slow one. So we'll enjoy (occasionally endure) our simple life here, the four of us in our 1980's pueblo-style ranch with roadrunners in the yard, with games and art and dolls and a wired-up pretend cafe; guitars and a piano and a bassoon; good food and hot tea and piles of books and yarn. I love your bright table cloth. It is so colourful. I will not take my decs down til the children go back to Uni and school. Then I will do a big spring clean. We were the same as you just stayed in the four of us watching a film relaxing , just perfect. Sounds so wonderful , cozy and relaxing the way you describe your house. It looks very lovely and cozy too . Happy New Year my lovely blog friend ! We took our decorations down on Sunday. We usually leave them up until after the new year but our tree was dropping needles like crazy so we "de-Christmased" the house early. Your home looks lovely... warm, inviting and cozy... I love the table cloth, so bright and cheerful! Happy New Year to you and your family! BTW - did you say you actually have roadrunners in your yard?? Please post some photos of them - if you can catch them that is!! We don't have them here in the UK. What a splendid, loving New Year's celebration! Happy 2014 to you and your Bears. :) Tablecloths don't have to be a perfect size. Neither do quilts, towels, afghans, etc. It's the meaning behind them that counts. I love yours! Love the splashes of bright color from your handwork (and the inherited patches) that bring sunshine right inside during a bleak time of year. Your house is so clean, simple, and pretty. It must encourage orderly practices from your children. I loved those days when it was "just the 5 of us" during a holiday break. We made our own fun, too, and it was better than anything else! Your New Year's Eve was perfect! Happy New Year, Jennifer! I love the photos of your home... it's so cozy. Your cactus is gorgeous, and such a lovely color, too. The minestrone soup looks delicious, and very healthy. And I love all the sunlight streaming through your home. I usually take my Christmas decorations down on Jan 1st, but was too busy today. It feels really odd to see them still there, so I'm determined to get back to normal tomorrow. I love all your cheerful fabrics and wish I had the sort of family who would look after pretty soft furnishings, but I don't. Hey ho. Ahhhh, it sounds like the perfect New Year with the family. Your photos are beautiful too. Happy New Year! Happy new year! I loved this post - enjoyed "spending the day with you". Our tree is down too and I like having things back to normal. I love how you put that quilted tablecloth on your table - it looks just charming! It all looks so cosy and beautiful, Jennifer. I should have been in bed by 10.30 but we were with friends, and stayed until the Midnight celebrations, followed by a quick exit and home to bed! 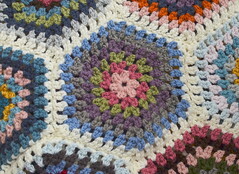 The vintage patchwork is very bright and pretty on your table, and I love the purple crotchet rug. We usually follow a 12 days of Christmas routine with the decorations, but they are coming down very quickly today! Great tablecloth, and I love that zingy afghan - the purple really sparkles! Hi Jennifer, It's so wonderful to read about your happy home and the positive energy you send out is always inspiring!!! Love the tablecloth!!! Have a fab week!!! I loved reading this lovely, calming post. This morning I have wandered around my home cursing and fretting under my breath. I think the time has come here to clear away Christmas. I have sat and stared at the picture of your lovely and tidy living area. I love the multi purpose function and all the little things that make it your home. I am looking forward to my simple life reclaiming me again. I did receive your email. And I did reply, but I think replying via my mobile doesn't work! Anyway it was completley my pleasure to send you a gift. And I'm thrilled that you liked it all. You are a very generous person - your support and comments throughout 2013 have been held close. I feel as if I have made a friend. This was such a lovely post, Jennifer. I felt like I was curled up on your couch and sipping a cup of tea while you were telling me about your home. And thank you for the movie recommendation. I've never watched Good Will Hunting, but have put it on my "to watch" list. I love this post Jennifer. What a beautiful way to ring in the New Year. Nice and slow and comfortable. Letting 2013 end and cleaning up and getting ready for 1024. 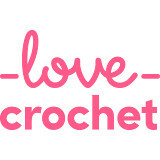 Hope you have a wonderful year full of love, laughter and of course crochet. I think we reach the time when we realise that Christmas is over and we want our surroundings back to normal. Today's the day for me, Mick's gone back to work so it really is all over. Happy New Year. I'm sitting here in my living room watching nothing but more snow falling...ugh, it's just not stopping. Gray skies and frigid cold temps here, too. I'll take some of your sunshine and warmer temps! I love the patchwork tablecloth - such beautiful colors. Your home looks so cosy and inviting Jennifer, thank you for inviting us in for a peek. My favourite quote is "a house is not a home unless it's got love in it" - and yours says it all! Happy New Year! I started taking down decorations today. The tree will be the last thing to come down tomorrow. I love crochet too, but between projects at the moment. I am waiting for inspiration to strike! Happy new year, Jen - we had a quiet one too, and I packed away all our decs earlier today. Your home looks and sounds just lovely and happy. 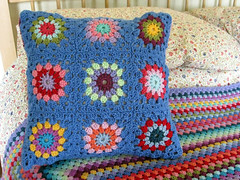 And I love the idea of having a "winter crochet HQ"! Hello Jennifer! Thanks for connecting to my blog, I just started following you, too. I love finding other NM bloggers! Are you in the ABQ area? Lovely, cosy post! I was also pretty glad to take the Christmas decorations down! It's good to get back to normal, I think. Ooh Jennifer you have been busy! A lovely post, showing your cosy home at it's best ... I was glad to take everything down and pack it away too ... The house feels more spacious and fresher somehow. Happy New year, Jennifer. It's still Christmas for us until our youngest grandson's birthday which is tomorrow on Epiphany. Then the decorations will come down and normal life will resume. I really enjoyed this quiet, reflective stroll through your lovely house. Your house is so light and cheery ... one senses the love that lives there too.